Liverpool’s new kits? Thumbs down! USMNT? Thumbs up! While we tend to be a bit of a traditionalist when it comes to uniforms, we admit to having a certain affinity for the off-beat. The Oakland A’s uniforms of the early 1970s and the Houston Astros’ tequila sunrise uniforms of the 1980s, while garish to some, are ones that we particularly like. We wouldn’t even mind it if the Cleveland Browns experimented with wearing a chrome helmet from time to time, as long as it was orange. 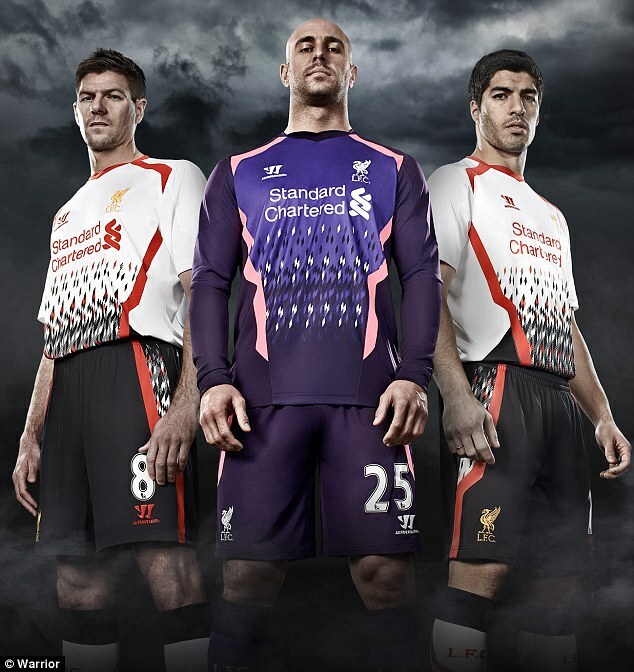 But we just can’t get behind two of the kits that Liverpool will wear for the 2013-14 Premier League season. There is nothing wrong with the home kit, as it is traditional and is based on the 1984 kit, a year that saw Liverpool when both the League Cup and the European Cup. But things start to go off the rails with the away kit, described by some has having a pattern reminiscent of an unappealing Christmas sweater (pictured). According to the club’s website, the neckline is based on the 1981 kit but has been “reworked to give the shirt a contemporary edge.” As for that diamond pattern? Apparently it is a “refreshed interpretation” of the shirts that were popular in the late 1980s and early 1990s. We’re not sure that we feel any better knowing the club was in on this, but it wouldn’t be the first time a team gave up control for the sake of marketing. And, at least publicly, team officials are being good company men. But the away kit looks rather plain once you get a look at what will reportedly be the club’s third kit for next season. We may be going out on a limb here, but if your club is referred to as the Reds, it seems like it would be a good idea to actually have the color red incorporated into your kit. We’ll get to see the new away kit in action on Aug. 24, when Liverpool travels to Villa Park to take on Aston Villa in the second weekend of the season. With any luck, the purple-and-black third kit will never see the light of day. In better news, the U.S. Men’s National Team moved another step closer to securing a spot in the 2014 World Cup with a 1-0 win over Honduras. Jozy Altidore’s goal in the 73rd minute gave the USA it’s third consecutive win and second consecutive shutout. It was Altidore’s fourth consecutive international game with a goal. The win means the Americans have now gone 25 consecutive home games in World Cup qualifying without a loss. Interestingly, the last time the USA lost a qualifying match at home was against Honduras – in 2001. The result was also quite a difference from when the two teams met in March for the opening game of the Hexagonal qualifying round. That game, a 2-1 win by Honduras, left many players on the U.S. team reportedly complaining about Klinsmann. But just three months later, the U.S. finds itself at the top of the group (five points clear of Mexico) as they head into a break until they begin the final four-game stretch of qualifying matches on Sept. 6 against Costa Rica (where the U.S. is 0-7-1 all-time in San Jose). If the U.S. can take care of business against Costa Rica, they could clinch a World Cup berth in their next game, which happens to be a home match against Mexico on Sept. 10 in Columbus. Wow, you’re right Tom, those Liverpool away shirts are NASTY! Unlucky mate! I just don’t understand what Warrior was thinking. Well, I do, but I don’t like it.